To log in as administrator, enter login/password you indicated during installation(http://yourmortgagesite.com/admin/ – if the site was installed into the root directory). 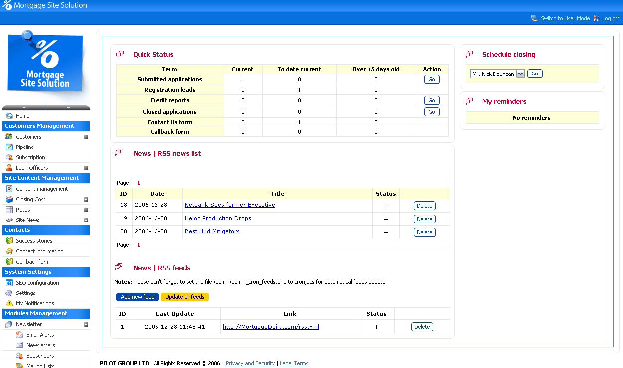 If authorization is successful, you’ll get the main page of admin area. Such sections as Knowledgebase, Site statistics and support are available there. Knowledgebase contains basic information on the product, FAQ and documentation. Latest news from company – developer is provided in section Company News. Section Support allows to contact Technical Support Team by any convenient means. Quick Status statistics provides information about your site and generated leads. Notes area contains information on important events and meeting for the current date. There is an opportunity to add RSS feeds for automatically added news to your site. RSS is a format for syndicating news and the content of news – like site. A news aggregator can help you keep up with all your favorite web logs by checking their RSS feeds and displaying new items from each of them at your site. Please don’t forget to set the file /admin/admin_cron_feeds.php to cronjobs for automatical feeds update. This page is always available by link “Home” in left top corner. Admin mode consists of several parts; below you can see a description of every part. Note: When you work with Mortgage Software admin area, server uses PHP sessions mechanism for identifying a user. Session is a period of time when you are active on the site. Sessions mechanism can’t precisely define the moment when you finished working with admin area in case you don’t use “Log out” button. So we use time-out – predefined time. After this time is out, the system finishes admin session automatically. In Mortgage Software timeout is set to 24 minutes. If during 24 minutes admin doesn’t take any actions, then the system asks you to login to admin mode again.